The Dawabsheh family won’t be entitled to government compensation granted Israeli victims of terror. The law governing compensation applies only to Israeli citizens and residents – including West Bank settlers, who live in territory Israel never annexed. To seek compensation, the Dawabsheh family would have to apply to a special interministerial exceptions committee. MK Jabareen (Joint Arab List) asks Attorney General Weinstein to apply the law to all Palestinian victims of Jewish terror. The case of the Dawabsheh family underscores the absurdity that exists today in the legal and political arrangements related to paying compensation…Victims of nationalist attacks should be entitled to compensation from the state regardless of whether they are Jews or Arabs…This is a population without means or resources, which has been under Israeli control for about five decades…As long as the state controls the Palestinian territories, it is obligated under international law to protect Palestinian residents of the place, including the obligation to compensate them for crimes of hatred and racism against them simply because they are Palestinians. [The harm is] terrible and irreversible. No amount of money can compensate the family for its losses. The Palestinian minister of health says that Dawabsheh’s mother will undergo a skin transplant surgery within the next few days, despite her critical condition. The toddler’s brother, Ahmad will also have skin-cleansing sessions. He still lies in the ICU in trauma. The Director of Tel Hashomer Hospital, where the family is being treated, says both mother and brother will need one year in the ICU to recover from their injuries. Dawabsheh’s father dies of wounds sustained in the fire. A postmortem is to be held in Rafidiya hospital in Nablus. A Palestinian official says this will provide evidence for a complaint to the International Criminal Court in The Hague. Saad Dawabsheh will be buried next to his son. Hamas urges Palestinian Authority arabs to to participate in the funeral and to attack Israelis throughout Judea and Samaria (The West Bank) after the death of Sa’ad Dawabsheh. The burning of this family is a turning point that will launch the start of the third intifada against the occupier in Judea and Samaria. [Dawabsheh’s death] demonstrates the enormity of the Zionists’ crime against this family, the result being that resistance in [Judea and Samaria] has become an obligation and a means of self-defense. The murderous settlers will not be deterred unless we initiate attacks – do not wait for them to arrive in our villages and towns. We have no other option but for a general confrontation with the occupation, without waiting for a decision or the granting of permission from anyone. Ahmad Dawabsheh, the four-year-old brother of Ali, opens his eyes today at the Sheba Medical Center and communicated with his family, though doctors clarify that he is not fully out of harm’s way. Details on the fire that killed Dawabshe’s are revealed by his mother’s brother-in-law, who addresses a Tel Aviv crowd of more than 2,000 Israelis protesting the killing, joined on stage by heads of the Israeli left. Ali’s mother tried to save her baby while fleeing from her home. This has no precedence. I was with the family at my father’s house, who has illness in the kidneys. And our mother is also ill. After midnight—1:30 [am] at night—each one went to their own home. After a half an hour, the family was surprised that something burning was thrown at their house. It was very strong and the whole house burned. There’s nothing left. At that moment my brother Sa’ed and his wife Riham caught on fire. Despite the burns, Sa’ed carried his son, four year old Ahmad, outside the house. Riham grabbed a blanket, she thought that the child, Ali, was in the blanket. But they learned that the child wasn’t in the blanket, but was left inside. She [Riham] began to yell “Where’s Ali? !” Ali was was burning. She saw him burn. She begged her family to bring her burned baby to her. At that time no one was able to enter the house because the fire was so big. By the time the fire brigade had arrived and put out the fire, and we finally got inside, we witnessed the horrific sight. We saw Ali completely burned, his whole body covered in burns and nothing we can do to save him. Riham went to sleep wishing her baby sweet dreams and they came and burned a family, sound asleep. Three Dawabsheh family members are still in a critical condition with life-threatening injuries in a hospital near Tel Aviv. The boy’s mother Reham, 27, is in a critical condition after sustaining third-degree burns over up to 90% of her body. Her husband Saad, 30, is also on life support at Soroka medical centre in Be’er Sheva after suffering third degree burns on up to 80% of his body. Reham is facing the most serious wounds and is on life support. The least injured of the three family members is their four-year-old son Ahmad who suffered second-degree burns of his body and is at the same hospital as his mother. The Palestine Liberation Organization says it holds Israel’s government ‘fully responsible’ for the death of Dawabsheh and will lodge a complaint with the International Criminal Court (ICC). Abbas says he has ordered his foreign minister to file a complaint at the International Criminal Court in The Hague. We want true justice, but I doubt that Israel will provide that. The Chief Executive Officer of Afghanistan, Dr. Abdullah, condemns the brutal killing of Dawabsheh. issues a statement calling the brutal killing of the toddler an act against the humanity. Abdullah calls on international community to strictly react against the act and introduce the perpetrators to war crimes court so that justice is availed. The statement also adds that the government of Afghanistan continues to support the people of Palestine to ascertain their political future through establishment of an independent government. Eighteen-month-old Dawabsheh burns to death after Jewish extremists attack his family in the Palestinian village of Duma. Ali’s uncle says the attackers approached the village in the early hours and knocked on the windows of the Dawabsheh house. The attackers then hurl molotov cocktails inside, setting fire to the house. Before fleeing, the attackers left the word Revenge in Hebrew spray-painted on the house, a so-called price tag attack. Family members bury Dawabsheh while his four-year-old brother and parents are being treated at an Israeli hospital for major burns, . Hundreds of mourners attend the funeral. Dawabsheh’s autopsy confirms that the he was burned alive. 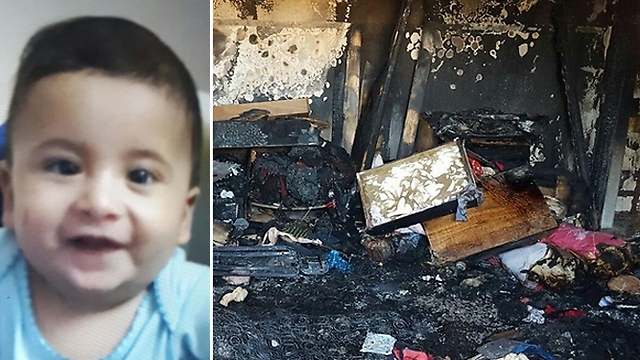 PA Minister of Justice Saqqa says there is soot inside the baby’s body, indicating that he was still alive when his body caught fire. [The body is] blackened, his features had melted, parts of his extremities disintegrated from the burns, while parts of the lungs and rib cage had melted. Saudi Arabia denounces the crime carried out by Israeli settlers resulting in the death of Dawabsheh and severely injuring his family. Minister of Foreign Affairs Al-Jubeir offers the Kingdom’s condolences to the family of the infant and the government and people of Palestine, blames the Israel for the death, and calls on the international community to protect the Palestinians from the aggressive practices of Israeli settlers.